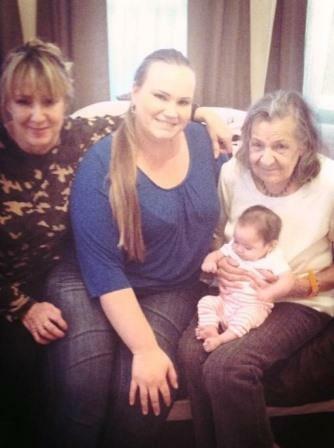 This is a photo taken last Christmas, 2013 of me, my daughters and my dear mother, Dolores Zerda Bishop, holding her great granddaughter! She is the good looking lady with the baby! I am trying to get assistance in helping my mother out from under the Public Guardian in Eldorado County. It is a travesty of justice and the whole pack of public guardians, public defenders, the judges, APS…all of these people are just the most unethical people and I am amazed that they continue to get away with how they ignore a person’s civil rights…basic rights and trample on justice. I am calling them out whatever way I can. I do not want to see my dear mother die in the place they have stuck her in. For her review hearing last June 2014, they sent her to court with holes in her shoes. I asked the PG, Lisa Groby why? Lisa Groby claimed my mother didn’t want shoes! They twist things around and use my mother as the excuse to cover up their neglect. It is horrible. I hope someone can help us! The Public Defender up there won’t help her at all. The judge that heard her case from the first conservatorship hearing through her last review won’t even acknowledge her in the courtroom. She has been through three. They just sit there and do not bring up obvious things like “oh, my mother can’t hear a word being said in the court!” So how can you conserve someone in a courtroom and not have them be able to hear at all. She had NO idea what was going on! My mother was first place under temporary conservatorship after being released by UCSF in November of 2012. She had been in their care for about two months. I was working out of town when this incident occurred and UCSF never contacted me. Their last communication with me in September was that they would find her a place in a care facility since she had memory issues. Instead they found her oriented X3, ready with a plan to rent a place in Placerville and released her, sent her in a cab to Placerville. We got a phone call from the hotel that she was there in their lobby with a debit card that didn’t work. Unfortunately the hospital forgot that she had deactivated her card. We were all very upset at home when we got the call from the Eldorado Sheriff that she was up in Eldorado County. I could not pick her up at the time due to car issues. This is when the APS got involved and turned her over to the Public Guardian. They got a temporary conservatorship. I began communicating with them about my mother’s care when I was called by one of them, Mari Robertson, I believe, who is with the Public Guardian. She called to inform me that my mother was in the hospital getting a blood transfusion. I was pretty upset to hear this as I had made sure that she got her iron while in my care the previous year. I told the caller that they were not taking very good care of my mother and that I would come get her. The woman on the other end of the phone threatened me with arrest if I did such a thing! Well, my mother should have been given her iron supplements. I called her case manager the next day. Lisa Groby is the Public Guardian who oversees my mother. Lisa had not reviewed any of her medical history in her chart. I told Lisa that my mother has a long history of anemia, numerous visits to Marshall Hospital, in Placerville, California, when she lived on her own because she didn’t like taking iron and that I had made sure she got iron regularly when under my care. This was the beginning of an adversarial relationship with the Public Guardian of Eldorado County because they didn’t like me pointing out their total ineffectiveness when it came to my mother’s care. I was working out of town at the time and could not get to Eldorado easily to try and fight this conservatorship. This is one point they have tried to use against me, referring to me as a flake in court! I was running the Point Arena Lighthouse at that time and it was difficult to leave when doing this job. The trip was about five-six hours and they would give me eleventh hour notice! The Public Guardian has no one to oversee them. They do lie to get their agenda met. In the recent court hearing they lied to the judge and claimed I refused to give them my address when I had given it days prior to Lisa Groby when arranging for my mother to visit for Thanksgiving. Now, because “I was late getting her back” they are denying her to stay over night for the holidays. My mother is very unhappy and our whole family is upset. Since they have had my mother under their care they have not gotten her a REAL hearing aid, which I have asked them to do numerous times. The Public Guardian has sent her to court hearings with no hearing aid, thus she did not understand any of the proceedings because she could not hear them at all. They lost her VA benefits that I applied for because they failed to respond to requests for medical records from the Oakland office. I notified Lisa in time but she still never sent in any records. They did not fix her cataracts for the entire time, in spite of my asking them at least fifty times via emails, phone calls and refused. Finally this October they finally did one cataract and only because I hounded them, made complaints to the Ombudsman (they said no basis for any complaints) and told me that my mother would not follow-up with drops (even though she was in a nursing home). My mother had fallen because she couldn’t see at all and when she came to my home for visits I found bruises all over her and took her to hospital and they have never been able to fully explain to me where the bruises came from. They did not like me taking her to the hospital at all and calling the police to document the bruises. Because I have filed complaints about her care they have been very nasty with me in most dealings. They find excuses for the bruises, shoes with holes and other situations that have occurred, they turn it around and claim I am making unsubstantiated claims, like they did in a recent hearing when I asked them to let her spend the night and I had to take them to court. I never got any notice of a hearing that the Public Defender was kind enough to request to see if she could at least spend the night for the holiday. In fact he called the night before and told me there was no hearing. The next day I get a call from the court while I am at work and they put me on the phone with the judge and the County Council to plead my case. I didn’t get a face-to-face with the judge so he could see me in person. The list with these people goes on and on…I even filed for petition for conservatorship but when it became apparent that the judge on the case, Judge Stacener, was biased I gave up because I could tell he was not going to do anything for my mother. She sat in court and told him, at her review hearing that she wanted to live with her daughter and have her daughter conserve her and he ignored her like she was nothing. He did this in other court hearings and I even had to ask him to listen to her. Her public defenders have done nothing to help her. Her wishes are ignored. The public guardian has refused to consider letting her live with me and my family in her own room with private bath and perimeter around house. Their first argument against me was that I didn’t have a perimeter. Now they really don’t have an argument. One time I asked and they said, “oh, you get emotional when you speak with caregivers.” Yes, this is my mother and when a caregiver acts like they don’t care or has a nasty attitude, or tells me my mother is in an emergency room and doesn’t even know what hospital she is at, yes, I get emotional! This is not right that this public guardian has such power over my mother and make HER suffer. I have tried speaking with their supervisor Jan Conway, but she basically ignored my requests. I don’t know why they are so adversarial but they have put my mother in Windsor and thrown away the key. The family should be able to take care of her. We have the resources and she could have her own room in a beautiful home. My daughter wants to be her caregiver. When I have gone to court in the past they sit there and glare at me like I am a criminal or something. It is horrible. I have tried to have a good relationship with these women but they refuse to work with family. I have begged to have her at least transferred closer to where we live. No, they won’t do that. They want her close to them! They are basically upset because I have pointed out where they have neglected my mother and become punitive. This recent Thanksgiving my mother was sent to spend the night with no toothbrush, no change of clothing and no pajamas. I tried calling Lisa Groby for two weeks and emailed her several times and no return contact. When I finally DID reach her she claimed she had called but my Iphone never had any number from her in the log. She has done this previously, claiming she called me but Iphone didn’t log any call from her office. It works with every other call though. Our family is frustrated and so is my mother. My mother is a smart lady who got her degree when she was 76. She is now 86, and yes, has memory loss but does not deserve to have her rights removed, disregarded and trampled on by this group of women who run the public guardian’s office. They are now denying her the right to spend the night with our family for Xmas because there was miscommunication with the ride on Thanksgiving. They lied to the judge in the court when I had to ask for them to allow her to stay a few days for the holidays and told the judge that “I was less than truthful and refused to give them my new address!” This was not true as when I initially called Lisa Groby about having my mom come for Thanksgiving, I gave her our new address! These women twist the story to suit their agenda. I have been calling all sorts of entities trying to get help. It seems no one has power or authority over them. The group in Eldorado all get paid from the same pool. So they don’t go up against one another. Judge Stacener is as unethical as they come in my opinion. When a sitting judge won’t even regard my mother’s opinion or statements and just ignores her, like he did in the courtroom on more than one occasion, it is not only disrespectful but a violation of her civil rights. I need help. Whatever help I can get to see my mother released from the grip of this group of Public Guardians who have taken her away from her family.